This is another one of many great reviews and giveaways that Joy of Momma Joyner and I will be bringing you with our 2012 Holiday Gift Guide!! 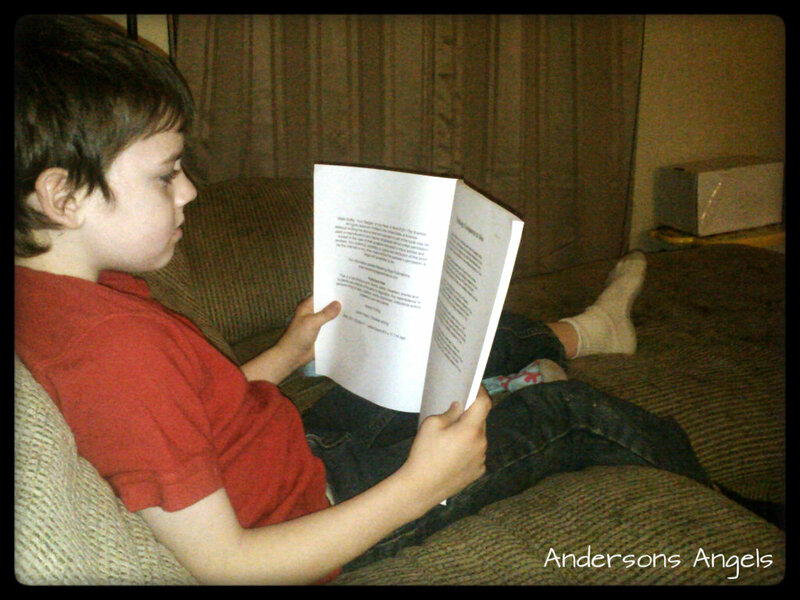 Do you love to read books with your children or maybe you have a child that is old enough to read to you. We love doing both in the Anderson household. There are many times in the evenings that Bubba will sit down and read a book to Pumpkin and Sweet Pea. If you remember in the past I did a review of a book called The Quirky Kids Zoo by Pat Brannon and I am so happy to have teamed up with again to bring you some more wonderful books. These books are all so wonderful to read and my favorite is "Walk Softly You're Steppin' On My Heart". It is filled with many inspirational Christian poems. The kids all loved "The Year Santa Refused To Wear Red". They said Santa seemed like a cowboy and they love cowboys. They found it amusing that Santa wanted to give up his famous red suit to look like a cowboy instead. Jake really enjoyed "Mudpuddles and Muscadines" because it is a heartwarming and sometimes humorous collection of Southern anecdotes. 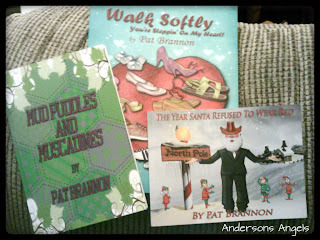 These are three of many wonderful books that Pat has written. 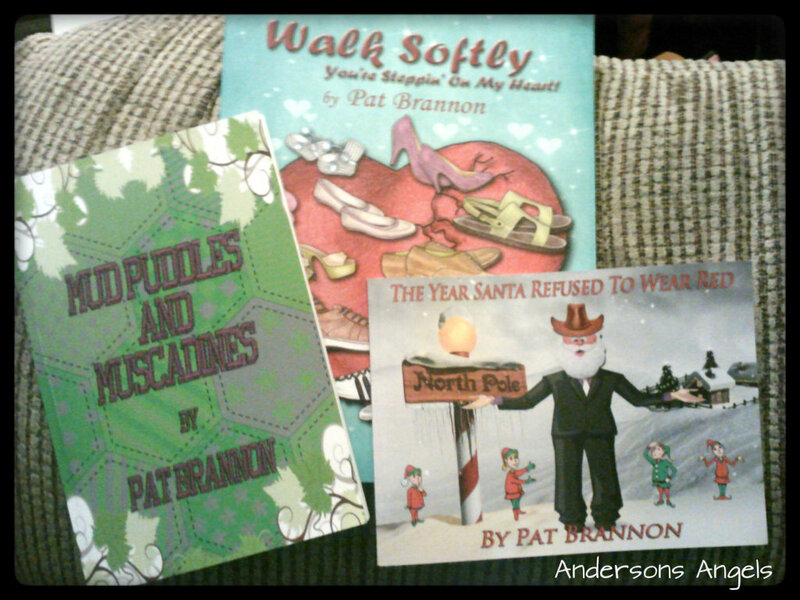 I would highly suggest checking out all Pat's books they make wonderful additions to anyone's book collection. Pat has been gracious enough to offer a signed copy of "The Year Santa Refused To Wear Red" and "Mudpuddles and Muscadines" to one lucky reader. My favorite book of the two you posted would be Mudpuddles and Muscadines. I think my grandkids would love it! My favorite book is Siddhartha by Hermann Hesse! Thanks for the awesome. By the way, I love the Thankfully Homemade button!! My favorite book is Sense and Sensibility. My daughter's favorite at the moment is The Snowy Day. Brown Bear Brown Bear! My little girls current fave! I love to read JD Robb books but I love reading any funny to my grandkids. Hmm.. My favorite book... I am not much of a reader myself, but I did manage to read the Twilight series and enjoyed it!!! The Bible is my absolute favorite, and then there are tons in 2nd. I love to read to the kids and myself!